Narú was registered a Guatemalan non- profit Association in 2010, having by then worked for seven years in the Senahu region. It is led by Yvonne Sinclair (British/Swiss), who founded the projects after visiting the country, and subsequently settled there. Narú now works with a team of local Q'eqchi' staff by project, together with volunteers here and abroad. The non-executive board brings specialist skills and deep knowledge of the context: Dr Marlin Dearden (USA) Yale graduate in Public Health; Dr Eva Sanzin (Swiss / Guatemalan) Clinic and NGO administration; Beth Dearden (USA) Master of cross-cultural training; Francesca Wade (British / Canadian) Consultant to NGOs in country. 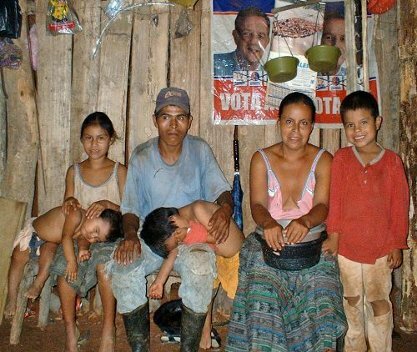 This family, living with the effects of contaminated water, inspired the first Narú project in Senahu.